An unidentified man was taken into custody by security guards at Century 21's Center City location. The guards claimed he shoplifted. He denied the charges, imploring the guards to search his bag to no avail. Here’s what the public doesn’t yet know: Whether the man seen getting roughed up outside a Center City department store on Thursday night had actually shoplifted. 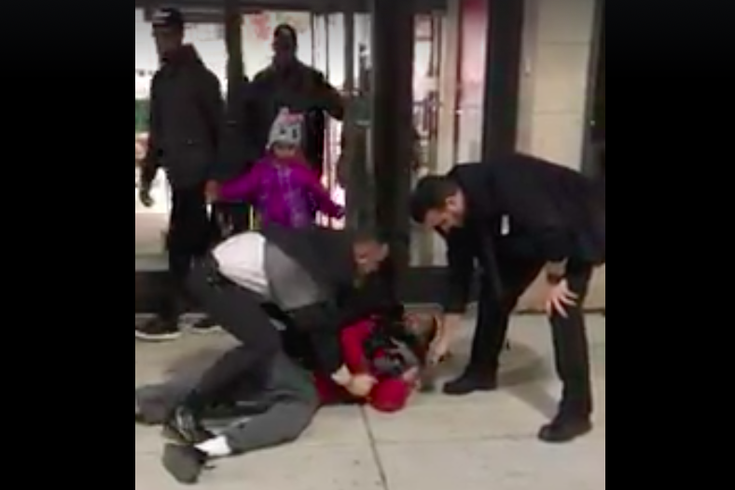 Here’s what the public that saw a nearly two-minute video posted to Facebook does know: He vehemently denied the allegations as he got pinned to the sidewalk by a pair of security guards who hauled him back into the store. Questions about the incident linger because a Philadelphia Police Department spokesman said Friday morning that there’s no report of a shoplifting arrest from the location. The video was shot by Greg Windle, a local journalist who witnessed the confrontation as he was walking home from work along the 800 block of Market Street around 5:30 p.m. Speaking to PhillyVoice about the incident, he said the “sound of something slamming into the door” prompted him to stop in his tracks. “I turned around and saw one of those (security guards) grappling with the man pressed against the door. Then, he was slammed onto the sidewalk,” he said, prompting him to take out his cell phone and start recording. “Some of the stuff I heard concerned me. Windle, who writes for the Public School Notebook, said those words reminded him of an article he’d recently read about shoplifting diversion programs that have come under fire as extortive. “It made me a little suspicious. He was getting brutalized, maybe even exploited, so I followed them into the store,” he said of an incident in which he's heard on camera declaring, "You know this is an assault if he didn't steal anything, right?" The video cuts off when he gets inside as guards tell him it’s illegal to film inside. Though he turned the camera off, Windle said he saw the guards “dragging” the man to the back of the store. His request to see what was in the bag when the camera was off was also denied, Windle said. “They wouldn’t even respond,” he said. “I follow a lot of police brutality issues and reading these stories, I have admiration for the person who stands there and starts filming instead of walking away, which is easier. Windle plans to reach out to City Councilwoman Helen Gym and Mayor Jim Kenney and send the footage over to them. Calls to Century 21 seeking comment about the incident, which you can see below, were not immediately returned on Friday.